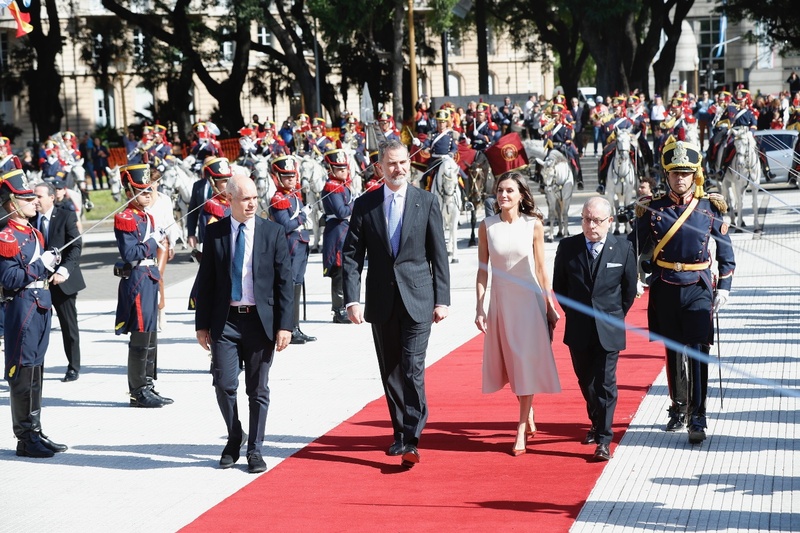 King Felipe and Queen Letizia of Spain kicked start the three days long State Visit to Argentina with an official welcome ceremony hosted in Buenos Aires by the President and First Lady of Argentina. 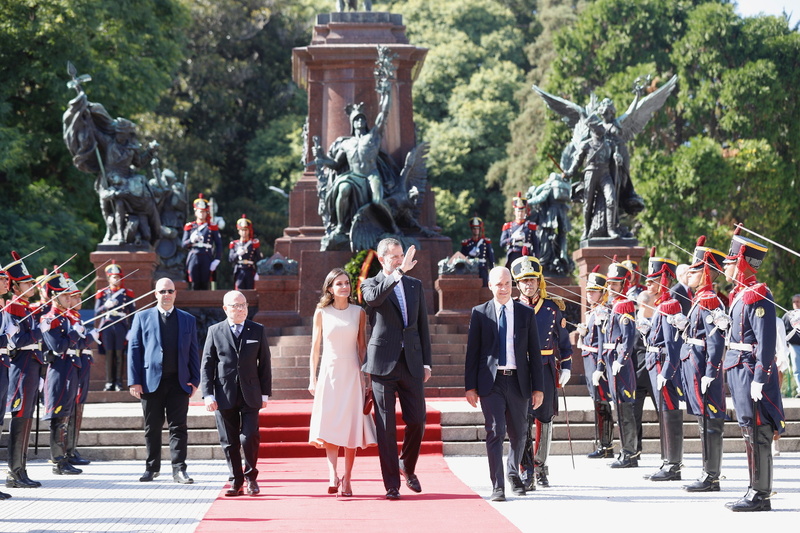 The day began with a floral welcome at the the Monument General Liberator San Martin followed by the Nationa Anthem of both countries. 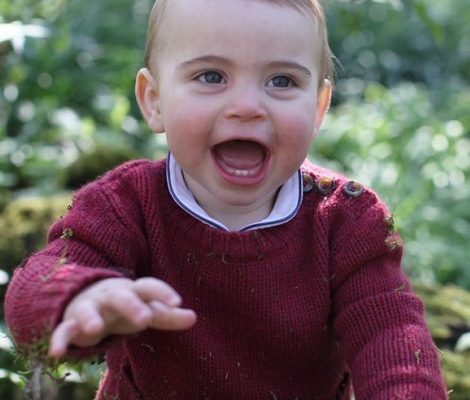 The royal couple laid a wreath at the Monument. A minute’s silence was observed in the honour of the victims of New Zealdn Terror attack victims. 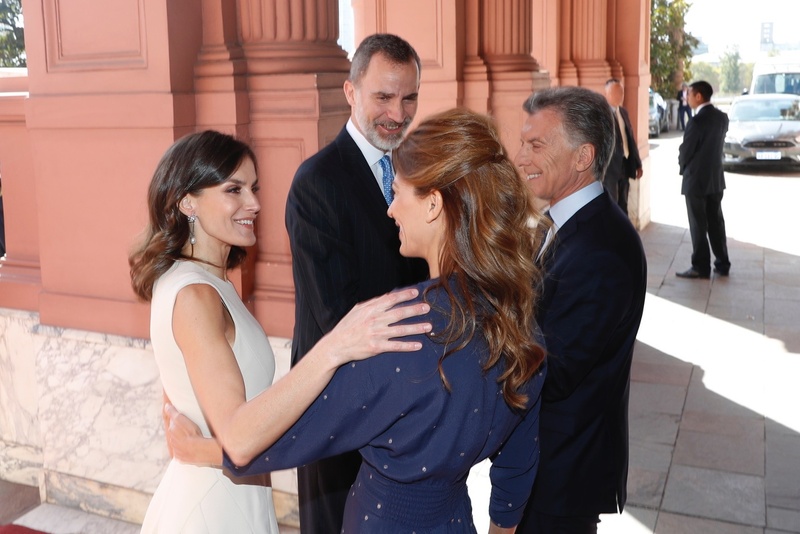 Next the royal cuple was escorted to the Goverment house for the offcial welcome reception where they were received by the President of the Argentine Republic, Mauricio Macri and the First Lady, Juliana Awada. Queen and First Lady exchanging greetings. 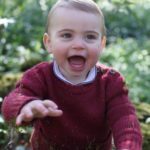 A video of royal couple’s arrival at Government House. 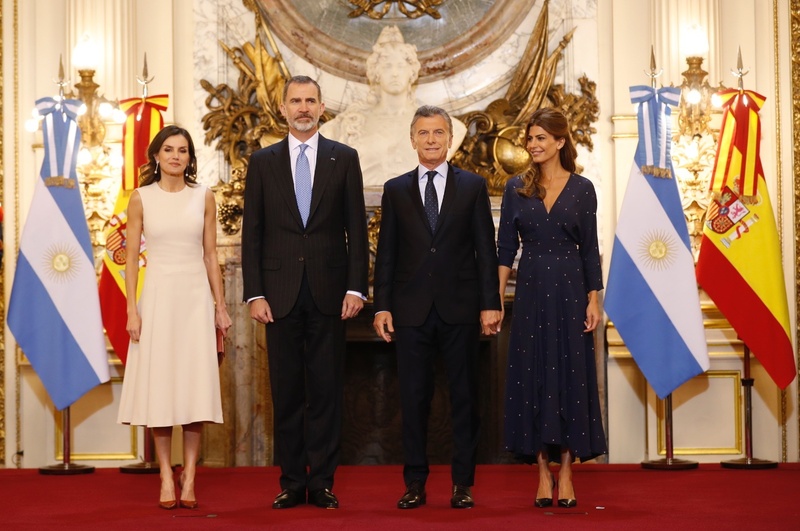 Official photograph of royal couple with President Mauricio Macri and the First Lady, Juliana Awada. 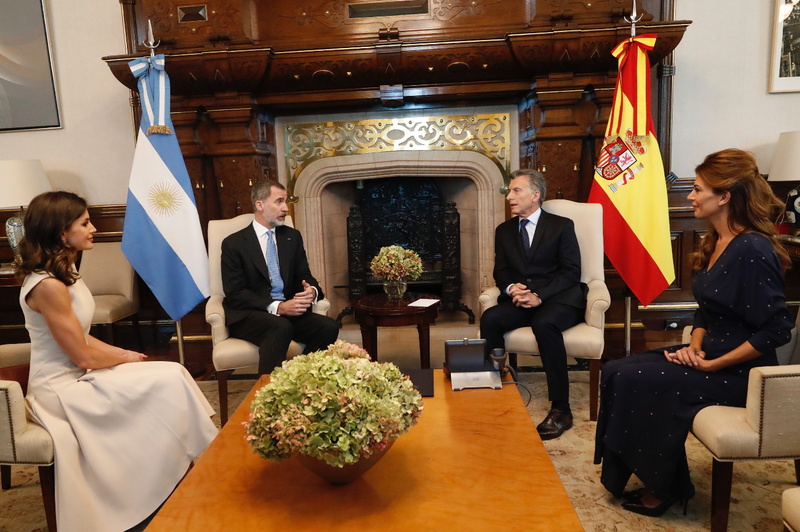 After the ceremony King Felipe and Argentinen President held a meeting along with the delegates of both countries. 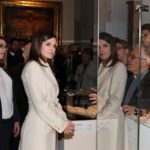 Queen Letizia and the First Lady, held a meeting on early childhood and rare diseases. Letizia and Juliana in meeting. For the first day of the visit, Queen chose a very elegant off-white midi dress by Pedro Del Hierro. Huge thanks to Nuria on Twitter for the dress id. The sleeveless dress featured a round neckline with fitted bodice and pleated skirt. 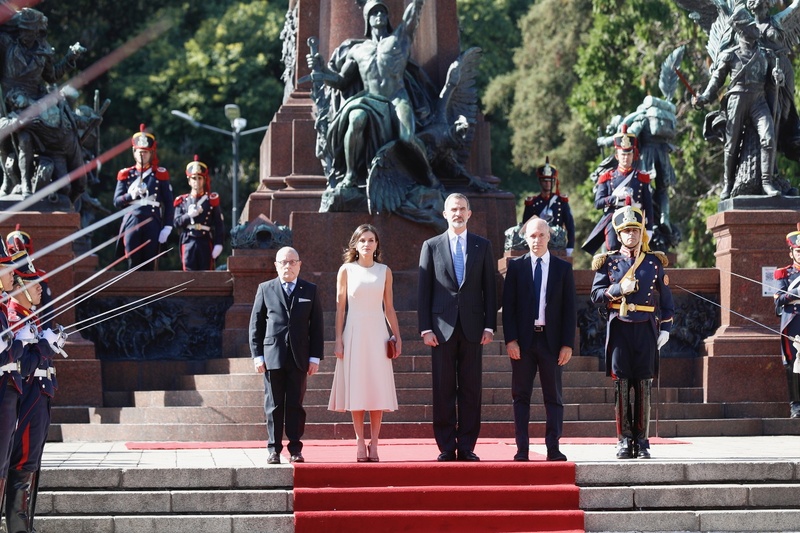 Letizia paired the outfit with a contrasting red pumps and handbag. Both pieces were seen at the Peru visit in November 2018. She was wearing red leather and suede combo pumps from Magrit. And carried a matching clutch from the same label. 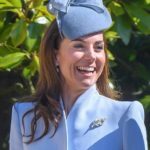 Queen finished her look with dangling white gold and diamond earrings that have a pearl dangling at the end and arc shaped floral base. 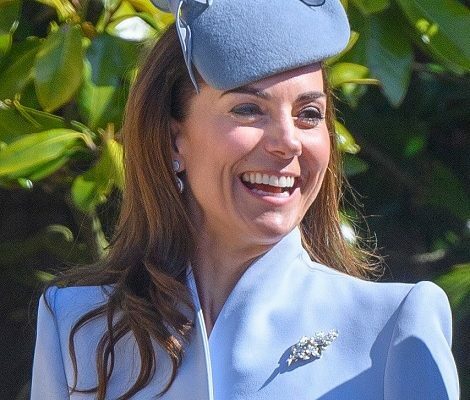 The earrings belongs to Letizia’s Mother-in-Law Queen Sofia.